From the tram, from the train, from the outside, and from the above - wherever you stand to look at it, Wroclaw is always impressive. There are certain places worth visiting in order to see the city from a different perspective. Although the landscape is quite plain, the architecture has lots to offer to all the height-lovers. 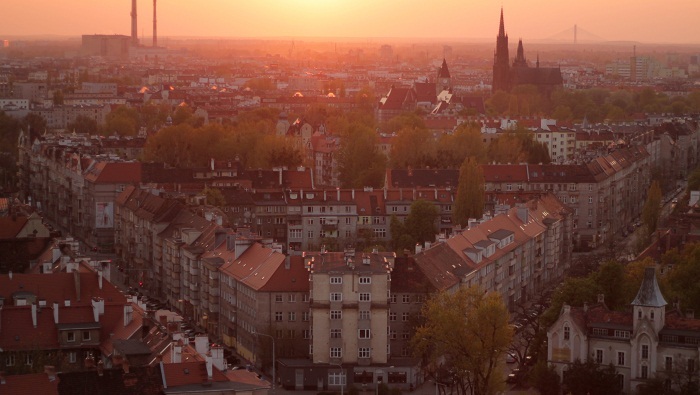 Here is the list of the most interesting viewpoints in Wroclaw. So, you think you know the city like the back of your hand? Or maybe you would like to learn more about the street map? Change the route of your everyday walks and try something different. Sometimes it is a really good idea to see the sunset in all its glory. There are many high buildings with viewpoints, but one of them is definitely the most popular. You are probably already familiar with jest about the Sky Tower, but Wroclaw seen form its viewpoint is no joke. It really takes your breath away, but well, it is almost 200 m. I recommend going there at night to see the illuminated city, and also on a sunny day - to learn how colorful it is. You can reach the 49th floor for PLN 10 or PLN 15 (full and reduced-price ticket) Monday to Friday from 9 a.m. to 9 p.m., and on Sunday for 10 a.m. to 8 p.m. It is also possibile to purchase the ticket online. Suggesting a visit in Galeria Dominikańska in order to see Wroclaw from the bird’s eye view just after mentioning the Sky Tower may seem like another joke, but there is a strong argument for this place. This is the only location where you can go at any time of day, when you are doing shopping or taking a walk, and peacefully observe the city from the above. The rooftop is available to eveyrone - all in all, it’s just a parking area, but there are no crowds of tourists there. And this is probably the greatest advantage of Galeria Dominikańska - you get an amazing view and peacefulness (especially, if it’s not weekend). And all that is for free. The Cathedral of St. John the Baptist in Ostrów Tumski district is one of the most beautiful pieces of architectonic monuments in Wroclaw. Odra River, Rynek, The Old Town - all look magical seen from the Cathedral. This place is really worth a visit, and since you’re there you shouldn’t miss climbing to its top. The Lookout Tower is opened May to October, Monday to Saturday form 10 a.m. to 4.30 p.m., and on Sunday from 2 p.m. to 4 p.m. If you decide to use the lift, it’ll cost you PLN 5. The heart of the city is full of viewpoints. Let’s start with the highest building, the St. Elizabeth Church - 91.46 m, where the narrow, spiral stairs take you to the very top of a beautiful tower topped with a cupola. The viewpoint is opened April to October, Monday to Friday from 10 a.m. to 6 p.m., and from 9 a.m. to 7 p.m. on the weekends. In the summer the tower is available for tourists longer, until 9 p.m. The ticket is PLN 5. Mostek Pokutnic [the Bridge of Penitents] near St. Maria Magdalena Church should be your next stop on 'the'bird’s eye view on the city' route. The place between the towers is alleged to be the meeting point for the souls of women who have chosen a dissipated lifestyle and had to be punished with a walk along the narrow footbridge. The innocent souls may also take a walk on the footbridge, if they want to take a glance at Rynek and its surroundings from the height of 45 m. The ticket is PLN 4, and it is opened 9 a.m. – 9 p.m. in the summer and 11 a.m. – 6 p.m. in the winter. If you get a bit further form Rynek, I suggest visiting Wieża Matematyczna [The Mathematical Tower], which tops the main building of the University of Wroclaw. This former astronomical observatory is today available for tourists Monday to Monday from 10 a.m. to 3.30 p.m. On Wednesdays the viewpoint is closed. Ticket prices are from PLN 5 to PLN 12. Spring is a perfect time for nice walks around Wroclaw, and it may be a good idea to visit the places you haven’t been to before. World is more beautiful is you look at it from the above. Especially, if you can recognize your favorite places or see your own flat from the Sky Tower viewpoint.